BOATERS ! Rare 2 bd - 2 ba condo overlooking your own 14' wide Boat Slip just one mile from the Beach and Gulf...10 minutes by boat and your sails are up or the fishing lines are out, or you're sitting in a waterfront restaurant. 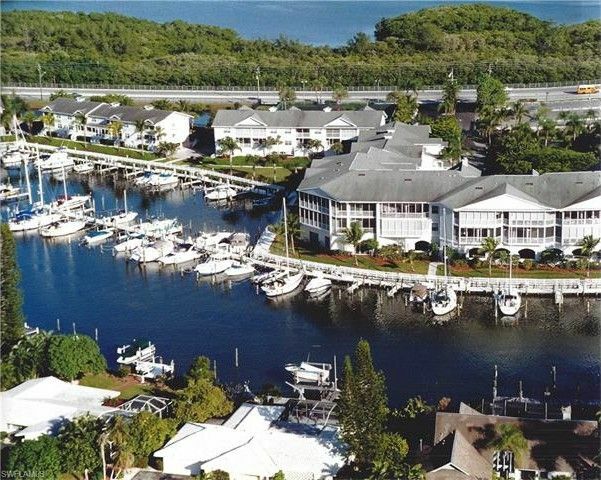 Located in beautiful Boardwalk Caper Marina Community, 251 boat slips on the areas best, deep water canal...with 300 condo units, totally walled / gated for your security. Also features one mile of a lighted 2 level boardwalk for early morning or late night walks, checking out the dolphins, manatee, osprey and pelicans or our beautiful sunsets! The community has 4 pools, tennis, basketball, tons of social activities and always...beautiful landscaping. This condo is CBS construction, pet friendly, walk out enclosed glassed lanai for extra space, elevator (NO STAIRS TO CLIMB), and under building parking. Kitchen is beautifully updated with wood cabinets, soft close drawers, granite counters, stainless appliances and both bathrooms are updated as well! Other special things as well...like mirror accents, crown molding, beautiful built-ins, tray ceilings, front and rear entry...Shows wonderfully...you'll love it! See it today! Agents...see remarks.